My second interview from the European SharePoint Conference 2016 in Vienna. My guest is Dux Raymond Sy, Chief Technology Officer at AvePoint and a long time member of the world wide SharePoint community. For this interview I used the new transkription function of auphonic.com to make the interview readable – works quite well – requires some more editing. 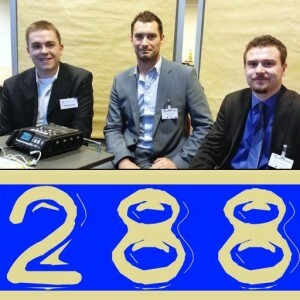 Michael: Hi everyone and welcome to another special episode of the SharePointPodcast in English. I have a second interview from the European SharePoint Conference 2016 in Vienna. My guest is Dux Raymond Sy, Chief Technology officer at Avepoint. He has a Twitter handle called @meetdux. I know Dux for over a decade right now, only online in fact before the conference. We never met in person so it was a great pleasure to talk to him and here is my interview with Dux Raymond Sy. Dux: Hey everybody. 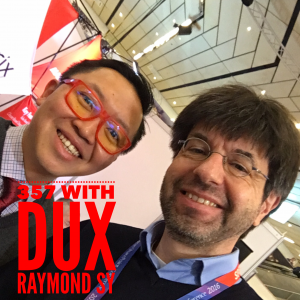 My name is Dux Raymond Sy, on Twitter I’m @meetdux it’s a pleasure to be here in Vienna, phenomenal conference, lot of energy, lot of crowd, SharePoint love is all over the place. Michael: Yeah it’s very interesting, 15 years of SharePoint looking back, see how this platform and all the ecosystem has evolved, how do you feel about it? Dux: You know 15 years I mean I have less hair today, I think I would say pleasantly surprised how the ecosystem has grown I mean there’s ups and downs. With the platform itself is solid I mean if you look at SharePoint specially the movement to the Cloud and Office 365, really SharePoint is now an essential element of Office 365 why certainly you can argue there’s more technologies you know from Exchange, SharePoint, OneDrive to Planner to Teams and Groups, but if you look at the fabric that ties everything in Office 365 is still fundamentally SharePoint which is really great. Michael: but it’s not SharePoint anymore, it’s more about digital work, it’s more about getting into modern work. Dux: I think bringing Jeff Teper back, the father SharePoint, is a brilliant strategy, because a few years ago the word SharePoint doesn’t even appear in Office 365. If you click on the waffle it would say Sites. These days they put it back in SharePoint which is great it’s a strong brand, people have affinity to it. Now it’s arguable if it’s positive or negative depending who you are but I think today it’s changing. Michael: The whole platform had changed – has your role changed over the years? 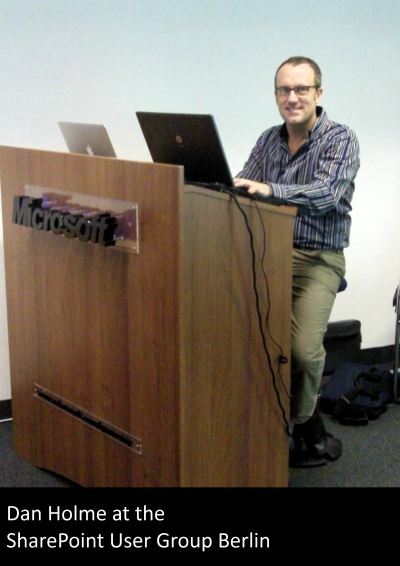 When you started with SharePoint in 2001 – have you been more like a kind of developer or? Dux: People that know me I have a developer background I start my career in Assembler, some of you may not know it, because you weren’t born yet, but when I started my career I programmed Motorola chips with Assembler and then I went doing VB, C#, dot.net. That time when SharePoint came up, I was already in a phase of my career where I’m doing more IT leadership. When SharePoint came out I was actually running an IT project manager organization. That time they’re either use email and Excel for project management or people use very fancy tools they have Primavera or the predecessor to Project Online and Project Server Project Central. And that was too big and heavy for people so I wrote the first business focussed book „SharePoint for Project Management“ because SharePoint is phenomenal for project manager – every company should go to the project site in SharePoint – so since then I was focused on how can you drive and get benefit from SharePoint from a business perspective. The advantages I have is I know the platform I know the technical aspect of it so I can connect the dots. Has my role changed? Not really, I’m still talking about and pushing how can we get the most value out of SharePoint. For example I was working with a customer recently, global organization and their were seeking advice: „So Dux, what should we do? Should we you know Planner, OneDrive, social?“ I go: „Why?“ – „Well it’s there!“ – I go: „Why what will activating Delve or enabling external sharing do to Michael in accounting? If you can’t give me that answer there’s no point. So my goal has always been: at the end of the day what’s the business value of these technologies. Michael: In SharePoint 2001 for the toolset of our intranet or whatever we had very limited capabilities right now with the new Microsoft Office 365 you have tons of options. Microsoft tells us – Hey, we provide you with a tools with millions of options. And customers asked me: „What should I use? What is relevant?“ Howdy you deal with this? Dux: Actually there’s a couple good talking points. First and foremost – enough with intranets – when customers come to me and they pitch their business „Hey we’re going to Office 365 will have a new internet!“ – Please stop doing that. That’s so 2001. Now, I get it, you can make beautiful interns with SharePoint especially with Office 365 with SharePoint online. But there’s so much more you can do. The next point I want to make is the first rule of Fight Club – the first rule of Fight Club is „Don’t talk about the Fight Club“ – so please don’t talk about SharePoint don’t talk about tools on top of Office 365. You don’t go to the business and say „How do you like your SharePoint? You want king-size wikis? You want a list libraries? Let’s supersize with doing some PowerBI!“ No, what you do is, you go to the business and ask, how can I help you get your job done faster, better, sooner. You’re doing this process it’s all email back and forth, oh, we can do better with workflows, Powerapps, Flow – you could do sophisticated things. What are you trying to do on working with this external vendor and we’re putting an event together okay that’s perfect for Planner. I need a report for my management – you can use PowerBI, Excel Services – period. People ask me „What tool should I use, Dux?“ I go: „What problems do we need to solve?“ That’s where we started from. Michael: So the role of IT is changing from installing and maintaining hard- and software to do real business consultancy. Michael: Your expectations for the next year, I think the future is harder to predict than ever, what is the coming up maybe 2017 to 2018 and what do you think may be the most interesting parts in Office 365? Dux: I’m putting my crystal ball prediction here. I think they’re still going to be a lot of movement to the Cloud. Customers are now seeing the value of the Cloud. But what’s exciting is I think customers will start seeing beyond the utility value of the Cloud – now what do I mean by that customers will start seeing beyond „Oh the Clouds is just for email for file sharing for intranet“ – we’ll start thinking about Business Solutions in the Cloud because now you can really create advanced capabilities, especially with advanced features that not only Office 365 provides but even Azure – think machine learning, bots, AI, Cortana analytics – I could go on and on and you can build phenomenal and impressive advanced Business Solutions. I mean one thing Microsoft is doing better if you know this check out appsource.com – It’s a Marketplace for Business SaaS Solutions, companies can put or even private companies can put so they can roll out very specific Business Solution using Microsoft Cloud Technology. Michael: Last question you was always very engaged in communities, maybe someone remembers the wonderful SharePoint Gangnam Style performance at the Las Vegas SharePoint conference, so how is your connection to the community right now? Dux: Yeah so thanks for bringing that up, I mean you remember when SharePoint starts there’s not much education there’s not much awareness there is only a handful of events, I was and I’m very grateful I had the opportunity to be involved when SharePoint Saturday was starting I was at the very first SharePoint Saturday. I helped to organize tons of SharePoint Saturday’s way back then, but these days since the ecosystem has grown so much I contribute as much as I can virtually speaking and writing. But my kids are growing up as well as some kind of focus on that community’s changing my little Community but I’m still involved I’m still in touch at the very least virtually. Dux: Right, it’s like that global family like you said I’ve known you for over 10 years and I come and see you it’s not awkward I say „Hi Michael“ like we were Facebook friends, and in some people may find that weird but now it’s really close. Family it it’s not just a community it’s a global family. 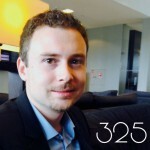 Michael: Dux, thank you very much to be here on the podcast it was great to meet you . Dux: Thanks I’m leaving to US on Monday so I’m going to Amsterdam tonight and stay the weekend here and get it. Thank you very much – bitteschön! Migration + Upgrade: Themen, die über die Jahre immer aktuell waren und auch aktuell bleiben. Heute spreche ich mit Dennis Hobmaier von AvePoint über die Dingen, die man vor einer Migration z.B. nach Office 365 bedenken sollte. Vorbereitung ist alles und deshalb geht der erste Tipp in Richtung “Altlasten beseitigen und aufräumen”. Und natürlich noch mehr alles zu hören im Gespräch mit Dennis.